There are lots of different aspects of this job that I really like. 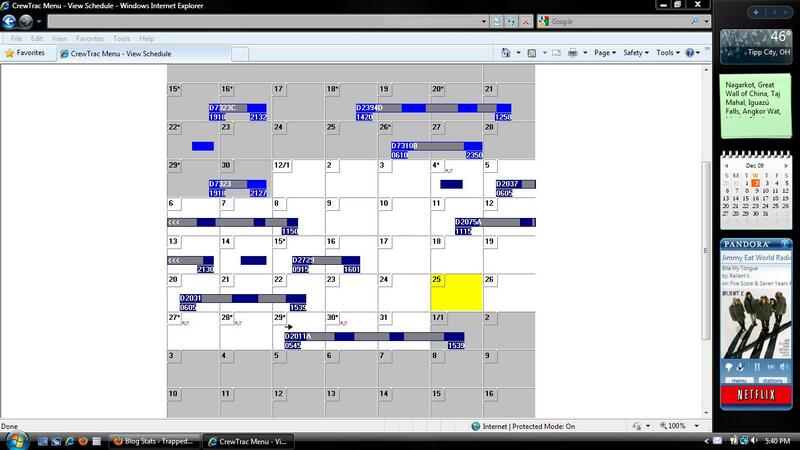 I like the flexibility in scheduling; no day, week, or month is ever the same. Sometimes I have very long days, and sometimes I have very short days. I also get to work with different people. Some of those people are awesome, some are OK, and some I’d rather not ever work with again, but it’s always different. I get to meet some interesting characters on the plane, too. Some are incredibly attractive, some are funny, and some are just rude, but I never know what combination I will get when boarding begins and we close the main cabin door. Some months I work a lot (when holding a line), and some months I don’t work very much at all (when I’m on reserve), but the constant and unpredictable variety is a huge part of why I love my job. However, the main reason I got this job and still love it as much as I do is for the travel benefits. Twice this month I’ve tried to take a day trip to NYC, and while neither has worked out and I haven’t left town, the ability to go there for the day and sleep in my own bed at night is a major perk. And I can do it for free. Hopping on a plane is like hopping in a cab for me. I can jet to Europe for $40. Awesome. Right now I’m in Valdosta, GA (WTH is that?) visiting my best friend and his wife. It’s great to be able to just say, “Hey, I’ve got a few days off. I think I’ll go somewhere and not spend a single red cent getting there.” I don’t have to take my work home with me, and I can do whatever the heck I want. I’m not paid a whole lot, but I didn’t sign up to earn a paycheck. I do this job to be able to fly wherever I want to whenever I want to, and for the time being I don’t want to do anything else. I love my job. Oh, and I’ll try to get some stories from the line instead of being all philosophical and crap.